The American Petroleum Institute (API) recently released a report documenting the prioritization of safety, health and environmental stewardship in the oil and gas industry. As the report notes, the industry’s commitment to producing more energy, improving operation efficiency, while reducing the carbon footprint, is unyielding. The American Petroleum Institute (API) recently released a report documenting the prioritization of safety, health and environmental stewardship in the oil and gas industry. As the report notes, the industry’s commitment to producing more energy, improving operation efficiency, while reducing the carbon footprint, is unyielding. Health and safety, the protection of people, the environment and communities, are top priorities for PESA Member Companies. The industry is safer than it has ever been. According to the API’s report, workplace, offshore, pipeline and refinery safety are constantly improving. 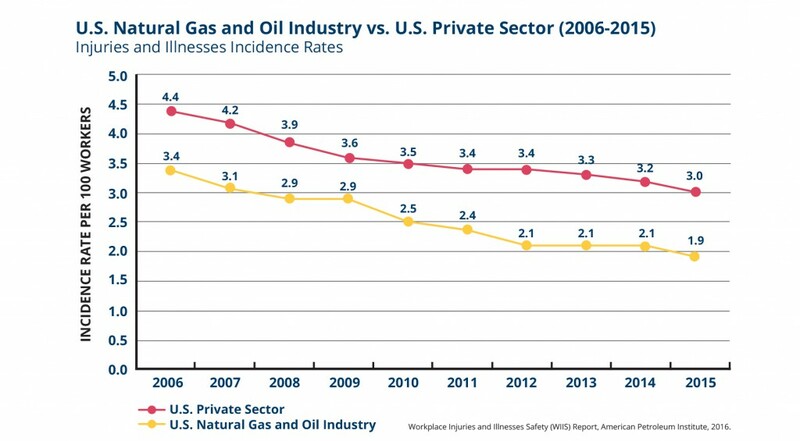 Regarding workplace safety, the oil and gas industry experienced a notable and ever-improving record of reducing incidence of injury and illness in workplaces across the country. According to the latest Bureau of Labor Statistics report, the injury and illness rate for the industry fell by 45 percent from 2006 to 2015. For offshore safety, industry standards are consistently reviewed and updated. In fact, for API’s more than 200 explorations and production standards, more than 100 of them published or revised since 2010. In addition, nearly 100 percent of the natural gas, petroleum products and oil delivered by pipeline is transported safely without incident. And the refining industry injury rate has been steadily decreasing, experiencing a 57 percent decline in job related injuries, illnesses and accidents from 2006 to 2015. The service and supply sector’s dedication and commitment to safety plays a critical role in the industry’s efforts. API notes that the industry is proud of its progress and understands that expanding the benefits of the world’s natural resources means continuing to invest time and resources to protect individuals, entire communities, and the environment. It concludes that the emergence of abundant natural gas has given the U.S. the market based tool it needs to protect public health and the environment in every aspect, providing the country with clean, affordable and sufficient energy sources. Read API’s full Health, Safety and Environment Report, Energy and Communities.